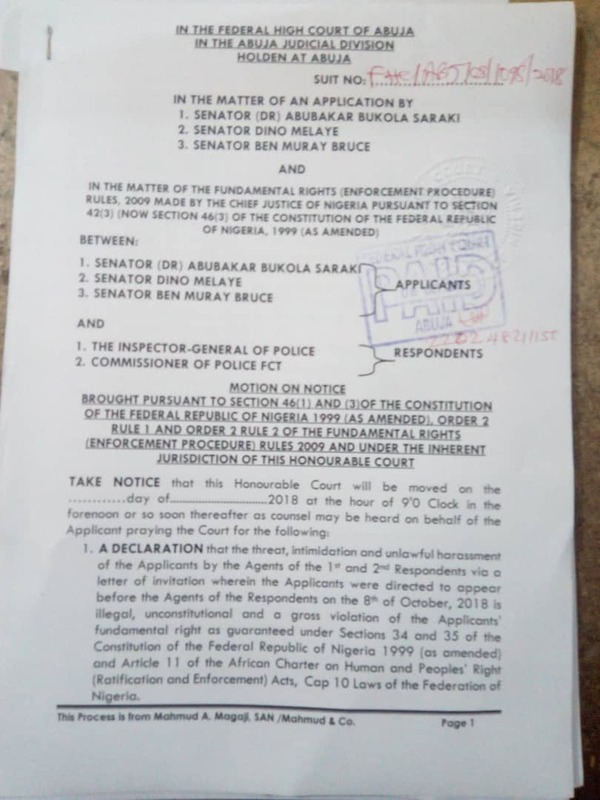 Nigeria’s Senate President Bukola Saraki, Senators Dino Melaye and Ben Murray-Bruce have dragged the Inspector-General of Police, Ibrahim Idris, to court. The lawmakers, who are all members of the Peoples Democratic Party (PDP), Nigeria’s main opposition, made the move over their invitation by the Nigeria Police Force (NPF) for protesting the Osun governorship results. Africa News 24 recalls that the three senators were among leaders of the PDP who led a protest march to the headquarters of the Independent National Electoral Commission (INEC) and the Force Headquarters in Abuja, Nigeria’s capital last Friday to protest against the outcome of the Osun State governorship election. During the protest, the PDP leaders demanded that their candidate, Ademola Adeleke be declared winner of the September 22 governorship poll. While the PDP leaders had said they led a peaceful protest, videos and pictures of the protest however, showed it wasn’t peaceful, as Bruce also confirmed, saying he was tear gassed by the Police. Apparently displeased with the outcome of the protest, IGP Idris, summoned the lawmakers but they removed to honour the invitation earlier today. 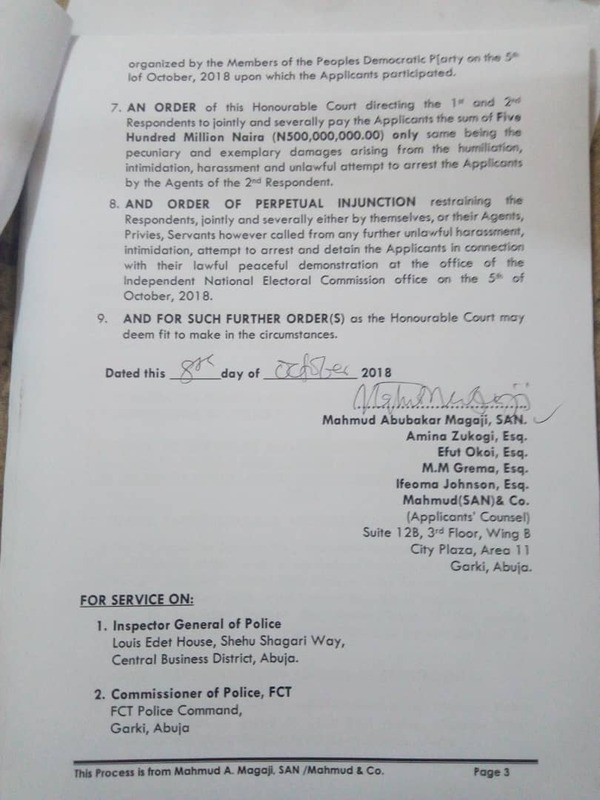 Moments after the lawmakers refused to honour the invite, documents have now emerged showing that the upper legislative lawmakers have sued the police boss for N500,000,000. 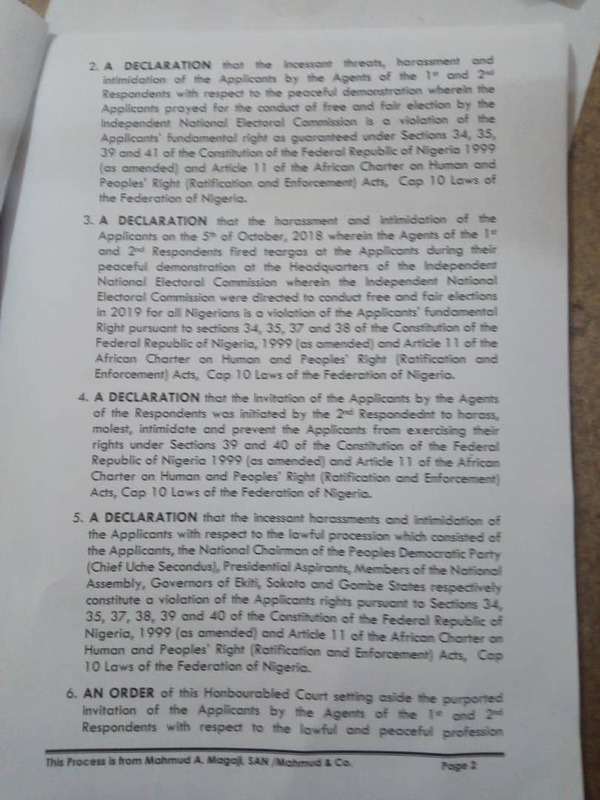 According to the court papers shared in a WhatsApp group, Youth Movement for Development (YMD) on Monday evening by Senator and obtained by our reporter, the suit, with Number FHC/ABJ/03/095/2018, was filed by Mahmud Abubakar Magaji, a Senior Advocate of Nigeria, on behalf of the lawmakers.